Growing up, we ate a lot of mouthwatering curries with rice and Indian breads, rotis. Maybe that defines why a plate of rice with a well made curry is comfort food for me. Add a bowl of yogurt to this and I’m one happy soul. 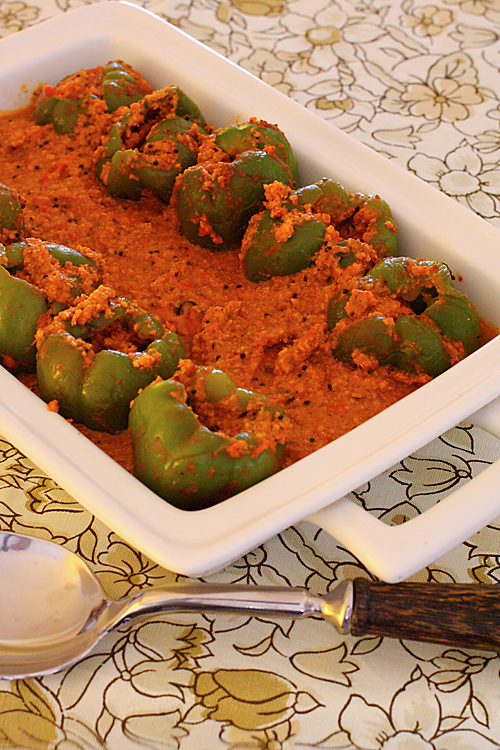 This stuffed capsicum curry stands out in my mother’s repertoire of recipes. It is one of her dishes that I enjoy the most. 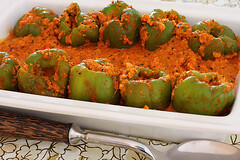 Stuffed with a tomato, peanut and coconut masala, it is simply delicious! And it has my grandmothers masala powder. It has a bit of both the special women in my life. 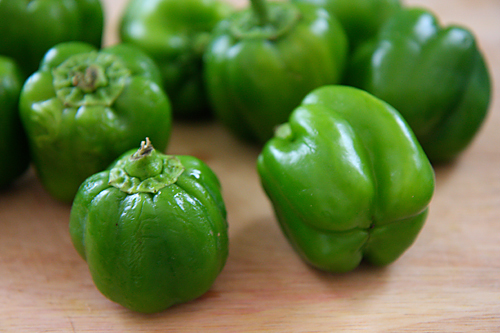 Bell peppers are widely known as capsicum in India. The big sized bell peppers (genetically engineered!) are commonly available these days and indigenous varieties are hard to find. It is important to use small sized capsicums for this preparation and I had to coax my vegetable vendor, who normally carries large bell peppers, to bring them for me. He even charged me a few extra bucks saying he had to walk extra miles to secure them! Considering the fact that I was able to create this dish with its authenticity intact, it was quite worth it. 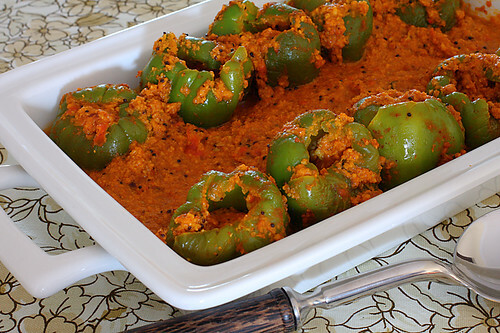 It is important to use small sized capsicum as their size is just right to hold the spicy masala stuffing. You could consider using the base masala with other vegetables like cauliflower or cabbage without stuffing them. In a blender or food processor puree the tomatoes, coconut and peanuts to a fine paste. Transfer to a bowl and mix in the goda masala (or or grandmother’s masala or 1 tbsp coriander powder +1 tsp cumin powder + 1 1/2 tsp garam masala ) turmeric powder, red chilli powder and salt. Keep aside. Wash and clean the capsicums or bell pepper. Carefully cut the tops of the capsicum and deseed them. Stuff with the tomato peanut masala mixture by placing about 2 tea spoons of the masala inside the capsicum. Mix 1 cup (250 ml) water into the masala to make a gravy. In a wok or kadhai, heat the oil over a medium flame. Put in the mustard seeds and when they pop, add the curry leaves and asafetida. Lower the flame and carefully place the stuffed capsicum pieces. Increase the heat to medium low and cook covered until white spots appear on the surface of the capsicum, about 4 to 5 minutes. Stir in the remaining masala mixture, increase the heat to medium and bring the gravy to a boil. Cook for 2 to 3 minutes and switch off the flame. Serve hot with the rice or bread of your choice. I like!! Is this similar to the mensinkayi palya that aunty used to make? yum & nostalgia… !! can't wait to make this for mihir. Anju: This is totally different to the mensinkayi palya that you are talking about. Simi: I'm sure Mihir will love this. This is soo different than the usual curry we make…with peanuts am sure it wud be an unbeatable combo! Anything that contains peppers, peanuts and coconut will make me drool! I love curries too, so that dish would be welcome at my table! Looks fabulous ! Sound yummy with the nutty flavor of peanuts.I can't wait to have this. this was really nice kind of reminded me of mirchi ka salan..next time i will try adding a little tamarind to make it a little more tangy. I made this today and it's really tasty. I did not have small capsicums so chopped the large ones and just cooked everything together. ,lovely. Thank you for this recipe. Made it today. It tasted delicious with both hot white rice and roti. Keep up the good work. Today I made this curry with cauliflower and I would like yo tell u that it came out awesomely delicious…..my husband and kid loved it very much…..Thanks for this wonderful recipe! Tejal: Lovely! Thanks for the feedback! Amruta- You are most welcome. So happy to know that you made this dish. Hey Anu, gonna make this today. Even got the small variety here in hyderabad. Excited 🙂 I usually just mix the roasted peanuts with tomato. Searched for your recipe and now will add coconut to the stuffing as well. I have been waiting to try and make something from divine taste. Padmaja: Awesome! hope you enjoyed this dish.